"Flooding is the Number One cause of weather-related deaths in the U.S.," said Tom Graziano of NOAA. Parts of Louisiana, Arkansas and eastern Texas, already devastated by severe flooding this year are at risk for more flooding through June, according to NOAA. "Communities along the Mississippi and Missouri River basins and parts of the southeastern U.S. from Alabama to North Carolina are at risk for major flooding," noted Brian Houser of Quake Kare, a provider of emergency survival kits. "Rivers and streams in the Ohio River basin and the Tennessee and Cumberland River Valleys also are at risk to exceed minor flooding, according to advisories from NOAA," Houser said. "We encourage people to be prepared for the range of spring weather threats, including flooding," said NOAA's Graziano. St. Louis-based Quake Kare is the nation's leading source of emergency survival kits. It provides custom- and pre-packed disaster preparedness and survival kits for virtually any type of devastating crisis. Quake Kare's four-person, 72-hour survival kit is designed to prepare a family of four for flooding and other disasters. 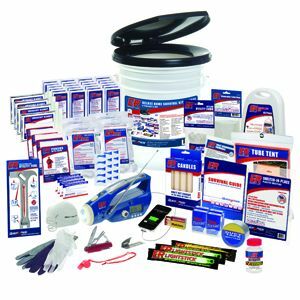 This kit contains reliable emergency preparedness supplies to including food, water, lighting, radio/communication, first-aid, sanitation, and tent shelter. It also includes a Solar / Hand-Crank Powered Flashlight, Weather Band Radio and USB Device Charger that never needs batteries. Quake Kare is a non-profit company owned by Lighthouse for the Blind-Saint Louis, a non-profit 501(c)3 enterprise that helps children and adults who are visually impaired maintain dignity and independence by offering employment, education and support services. All Quake Kare revenue directly supports Lighthouse programs for people who are blind and visually impaired. For information, contact Brittney Smithers, Marketing Manager, at 800.542.3697 or 314.423.4333, or see the websites http://www.lhbindustries.com and http://www.quakekare.com. Media contact: Jeff Dunlap at 314.409.5203.